January 24, 2009, 19:00: The new shopping cart was kicking out too many errors for my comfort level so we’re back to the old shopping cart. But, we’re working on it behind the scenes and I’ll keep you posted. It could be a day … it could be a month. Ya’ never know with coding errors. In the meantime, enjoy a trip down memory lane with our tried’n’true cart. It’s Bramble Berry 4.0! Over the next 48 hours, Bramble Berry‘s (www.brambleberry.com) online shopping cart will be on … and off. We’re migrating servers as we prepare to upgrade our shopping cart for the fourth time since inception (thus, the Bramble Berry 4.0). The site is due for an overhaul and your 29 comments on the “Make It Easy!” post made it clear that this was a priority in 2009. The switch to the new servers will take one to two days. Over this weekend, www.brambleberry.com might not come up for you or, if you’re served by one of the hubs that’s already done the switchover, you’ll be able to see the site and place orders. For those of you wanting to place orders over the weekend, we have staff working to take your phone calls. Our phone number is 360-734-8278 or 1-87-SOAP-STUFF. We think the new site is a huge improvement and hope you do as well. Shopping cart contents & totals on the left hand side of your screen. Adding new items to your shopping cart is easy! 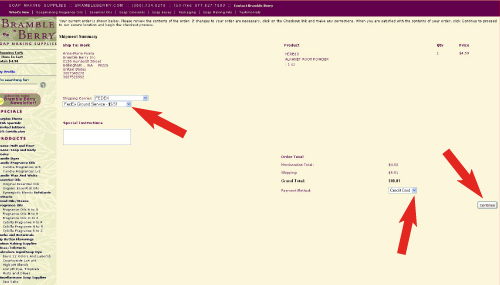 Click the button on the size of item you are purchasing, confirm quantities (1, 2, 3 …) and click the “Add to Cart” button. The new site is fairly intuitive but just in case it’s not, there are full and clear instructions below on how to check-out. There are clear confirmations about your shopping cart additions. Once you’ve added the item to your cart, a little note shows up at the top of the page stating what you added and the quantity. The item then appears in the shopping cart on the left hand, top side of the screen. Check out is now faster. 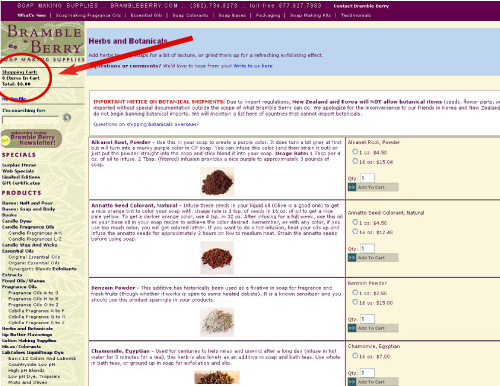 To check-out, click on “Shopping Cart Contents” (top left hand side of screen). This takes you to the screen below. If you have a coupon, this is the time to add it. Type in your sale code or coupon code and hit “Apply Coupon.” This is also the time to check your quantities and all the items in your cart. There are Quantity change options and Remove options if you see errors in your shopping cart (or dear goodness, choose to change your mind about any of our amazing products). You can check out with your credit card or PayPal (1/23/2009 – 4:30 PM – I’m lying. You can’t check out with PayPal. Yet. You will be able to shortly). If you click the PayPal button, you’ll be taken to PayPal to complete your transaction. If you click the “Checkout” button, you’ll be taken to the next screen below. Our site will remember you. The better, new and improved website allows you to register as a new user. The new shopping cart will remember you each and every time you order, keep track of your orders, allow you to track your orders and save you the time it takes to enter your bill to and ship to address each and every time. Register. It’s a good thing. Tax Button. If you live in Washington state and you don’t have a business license, I’m sorry. You do need to pay tax. If you don’t live in Washington State and don’t have a business license, don’t worry. You don’t need to pay tax. Keep the box checked and skip the rest of this explanation. If you do need to pay tax, this little box is for you. 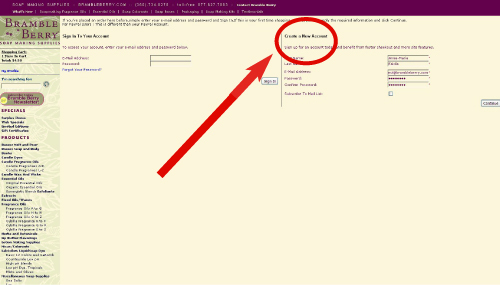 To calculate your sales tax, uncheck this box. The box says: Change this selection if you live in Washington State AND you are NOT tax exempt. When you’ve confirmed your shipping address is correct and made the tax versus no-tax decision (and for 99% of our customers, it’s not much of a decision. 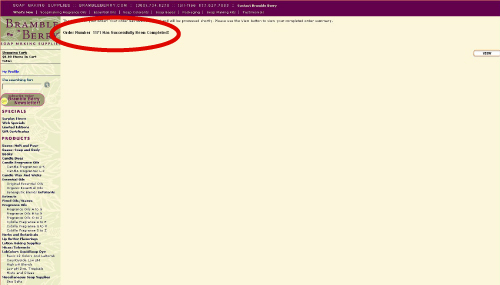 Most of you are non-taxable), click the “Continue” button on the bottom right hand side of the page. Shipping Method. You must pick a shipping method if you would like to continue forward. We greatly prefer Fed Ex to UPS and have only the Fed Ex and Priority Mail options on the shopping cart. If you really, really feel strongly about getting your products via UPS, we gladly ship however you want and have daily UPS pick-up. Just write us a thoughtful note requesting UPS in the Notes section (the one with the big arrow below) and we’ll get you switched out. 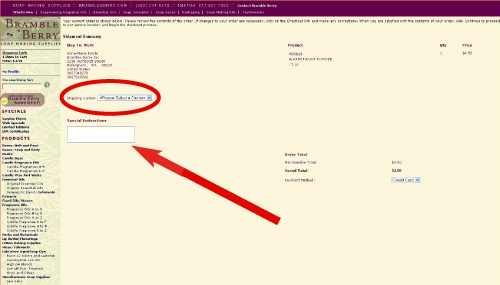 Once you choose Fed Ex or USPS, another drop down menu magically appears. Choose your specific method (2 Day, Ground etc…). 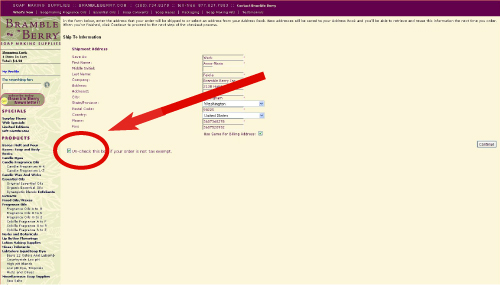 You must select your shipping choice from this menu before (again with the magic), the “Continue” button appears on the bottom right. Choose your payment method – Credit Card for online credit card processing or Phone/Fax. Click the “Continue” button. You’ll be taken to a page that looks like the one below. 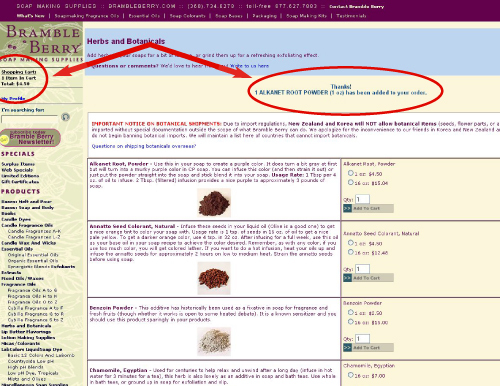 Click the “View” button on the right bottom to view your order. Tracking your orders is easy! 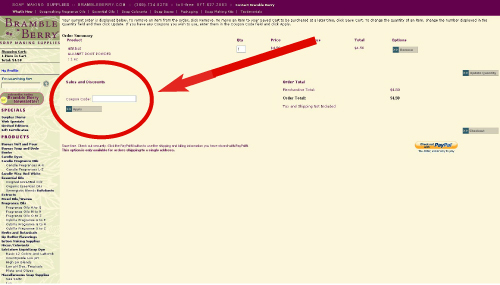 All you need to do is log into your account, click on “My Profile” and click on your recently placed order. 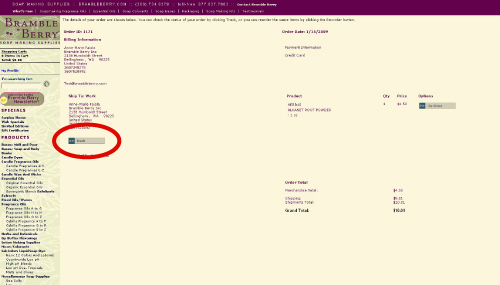 It will bring up a copy of your order and on the bottom left of the order is a “Track Order” button. Click this and your tracking number will pop up. This is still a work in progress. Your suggestions and feedback matter. I’m listening. We’re listening. Tell me how we can improve your shopping experience and we’ll work on it. In the meantime, I hope you like the Bramble Berry 4.0 shopping experience. Previous Post: Fly, Fly Away … Again. Thank you so much for doing this so soon. I’ve been waiting for my next BB newsletter before I order so the timing is good. This is going to make shopping so much more pleasant. Seriously though – these improvements look fantastic. I hope you put a link to this “tutorial” on the main page so people checking out can get assistance if they need it. You are ahead of schedule!? scheduled for later this year! I can’t wait to order! I am going to order next week! Yes, the shopping cart feature is awesome. No more clicking back and forth and hitting ‘cancel’ or whatever to keep shopping… As is the ‘sign in’ function!! Looks like it will remember who I am, ect! Yippee! Sooo tempted to place an order just to play with it…. YAY!!! You cannot see it, but I am doing a TOTAL happy dance. I am horriable at remember to order everything at once. I try to keep a ‘shopping list’ but it gets lots…often. I cannot tell you how many times I’ve called the very friendy, very helpful folks who work for you and had them add something to the order I already placed. Having a shopping cart that remembers what I put in it is AWESOME! Guess it’s a good thing I didn’t have time to place that order yesterday. Can’t wait to use the new system! I’m so excited about this!! I can’t wait to use it! Bless YOU ;-)) I love the fact that my shopping cart contents are always there for me to see while shopping. I might be the only one, but I seemed to be always going back to check what I had and what I still hadn’t got yet ;-)) Thank you.